Want to know more about what the Sky Trak Golf Simulator can do? Sky Trak makes playing in all weather conditions possible, without even getting wet! 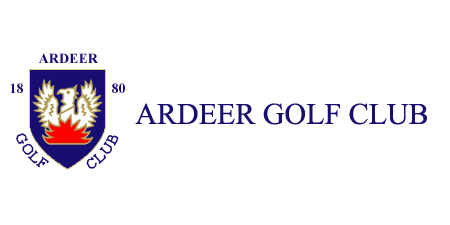 You can also play some of the worlds most famous fairways and greens from the comfort of Ardeer. With instant feedback from every shot you take you will have your handicap down in no time. Want to test your skills in all terrains? With our simulator you can customise not only the turf conditions but also wind conditions and other environmental factors. The simulator can be booked by members and non-members and at only £20 per hour, what better way to spend an afternoon. Booking must be at least 3 days in advance. Great for a day out! Set up a competition on one of the worlds greatest golf courses, from Sawgrass or indeed Augusta National, whilst we serve you few drinks from the bar and you chill with friends or family. The golf simulator experience is also suitable for kids. Catering is available if requested at time of booking, or alternatively we can assist with ordering from local takeaways. Our simulator is brought to you thanks to one of our dedicated sponsors, G. T. Groundcare Ltd.